Westwind School Division is pleased to announce Aleisha Van Hierden has been selected as the division’s Edwin Parr Award nominee for the 2018/2019 school year, according to a recent media release. 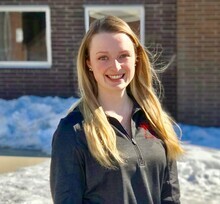 Recently, it was stated in the media release, completing her degree at the University of Lethbridge — Aleisha is a first-year teacher at Raymond Junior High School and will represent Westwind at the annual Zone 6 Edwin Parr banquet in May. Aleisha, it was stated in the media release, is among many outstanding first-year teachers who are demonstrating excellent skills and practice in instructional strategies, the establishment of positive relationships, student assessment and evaluation, and the knowledge of how to meet the needs of diverse learners with many learning styles. Each year, the Edwin Parr teacher award is presented to six exceptional first-year teachers from across the province of Alberta. Named after school board trustee and former president of the Alberta Schools Trustee Association Edwin Parr — this award is presented annually by the Alberta School Boards Association (ASBA).